A bit of a warm-up today 70’s in NJ, nothing to severe. It cools down again Thursday evening which I love, it makes the fall colors that much brighter to me. The NY Mets have the chance to clinch a spot for the World Series tonight, YAY!!!! Happy dance happening around here!! Let’s talk dining room, I showed the buffet that I redid the other day. 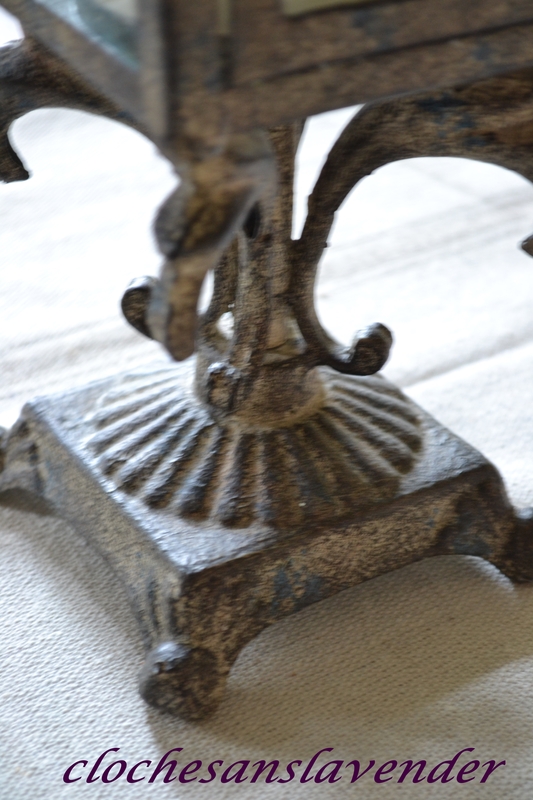 Today, I wanted to show this again, Two reasons, one I wanted to mention how doing some repurposing on these buffet lamps has given me a different look I wanted to accomplish. I purchased new shades in a brown silkish fabric, I think I just made up a word??? By doing this I accomplished two things. First, the lamp change added warmth and an age quality. Second, the shades make the landscape oil painting purchased years ago bring out warm tones in the painting. The next picture I will show, known as a no, no in Blogland, shows the buffet lit at night and the cast of the glow and warmth of the painting with the small vignette. Pretty, right? Now, on to the dining room table decorated for fall. 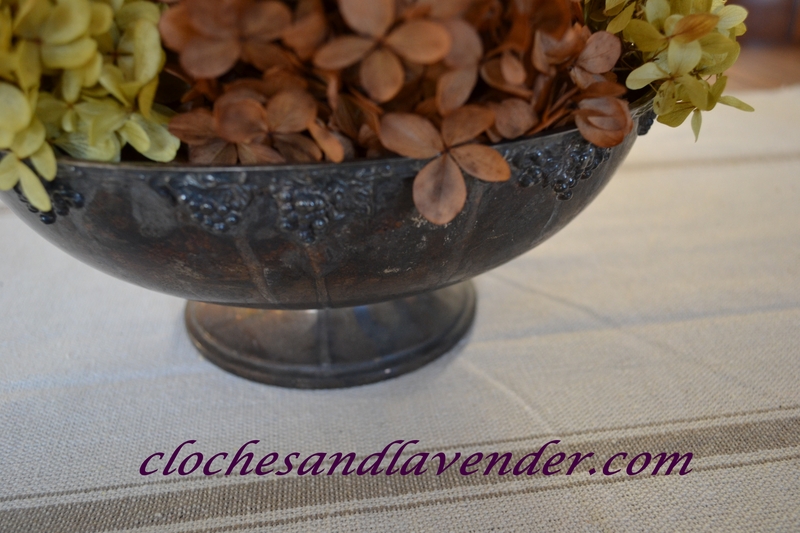 I chose to keep it simple this year, I used a tarnished silver plate bowl I purchased from Susan over at Must Love Junk. She has a wonderful Etsy shop, you should check it out. The plan, filling the bowl with a Mercury Glass pedestal I have which is part of a Cloche. 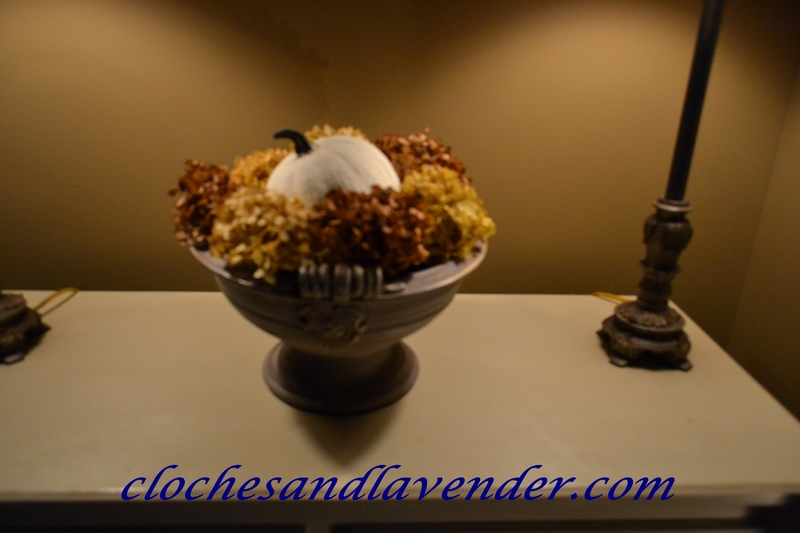 I added dried Hydrangea I have been using around the house. I purchased two small sets of velvet pumpkins from Amazon this fall. The colors to work in the dining room and the great room coffee table. More on that purchase in another post. I think they look pretty and add a whimsical feel. I added a plain grapevine wreath underneath for texture and some acorns were also added. Where are the acorns from you may wonder, real or fake?? Answer, real and from our old neighborhood. Our old neighborhood is filled with oak trees and Audrey brought my love of acorns to life. I didn’t know how much I loved these until living with Audrey while building the house. She has always loved them so it caught on with me in a big way. So what does your best friend do, why of course walk around and collect you 100 or so acorns. Now that is a BEST friend! She brought them down to me and even washed them for me. Believe that??? She knew my hands couldn’t hold on to these tiny acorns and wash them one by one. Yes, one by one. She wanted to save John from the job and he thanks her very much! I will post a picture of the acorns in my Great room post decorated for fall. Details of the silver bowl. Taking these pictures made me realize I haven’t taken a close up of these lanterns we use all the time on our table. A purchase from Pottery Barn many years ago. I use a battery operated flameless candle inside. 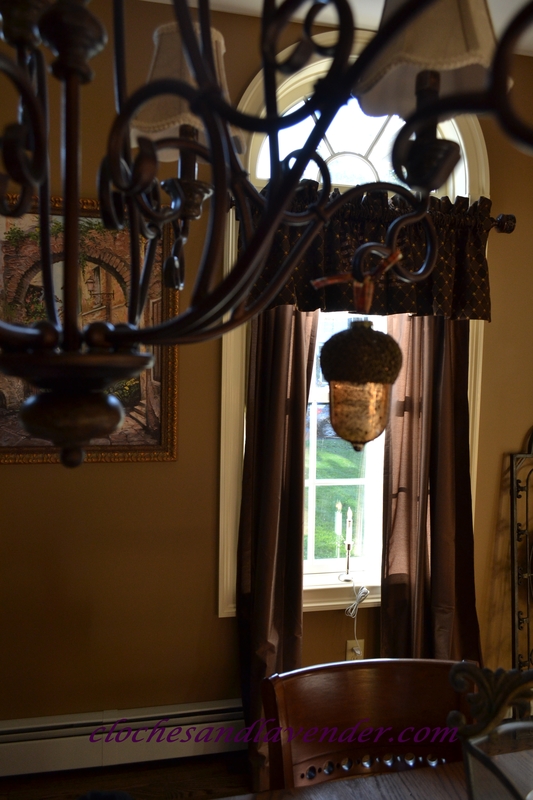 From the chandelier I hung brown Mercury glass acorns bought years ago at a little store Audrey and I visit in NJ. Are these not gorgeous??? Look at the beading and the light shining through and the transparency of the glass. There you have it, the dining room with fall glory. Next I will bring you to our entrance to the house, the Foyer dressed to greet people. Very pretty! And I don’t think it’s a no no to take a photo at night – sometimes that’s when something looks best. I love the Tuscan feel to your room. And the next time you want velvet pumpkins, just let me know. I make them all the time and would be happy to have sent some to you, my friend. so I live in NJ too, down the Shore (exit 80!!) and its beautiful, I myself hope it stays this way, but…..well. anyway. anyway. I love your stuff!!! love everything you post. a good inspiration for me. 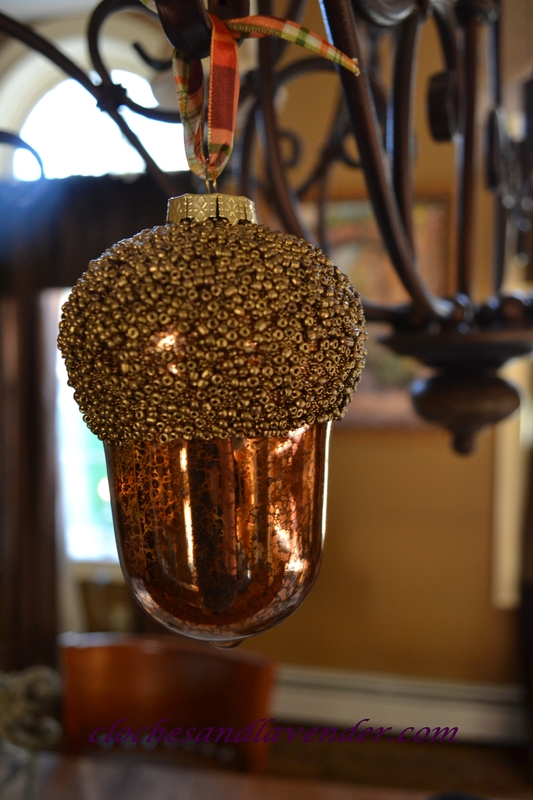 anyway….I wondered, since I saw those lovely glass acorns hanging from your chandelier, and they are beautiful!! but you have shades on yours, I too have shades on my little lights. but I’ve seen some that have no shades. what is your view on that??? I think it looks bare on mine, but …??? thank you!!! 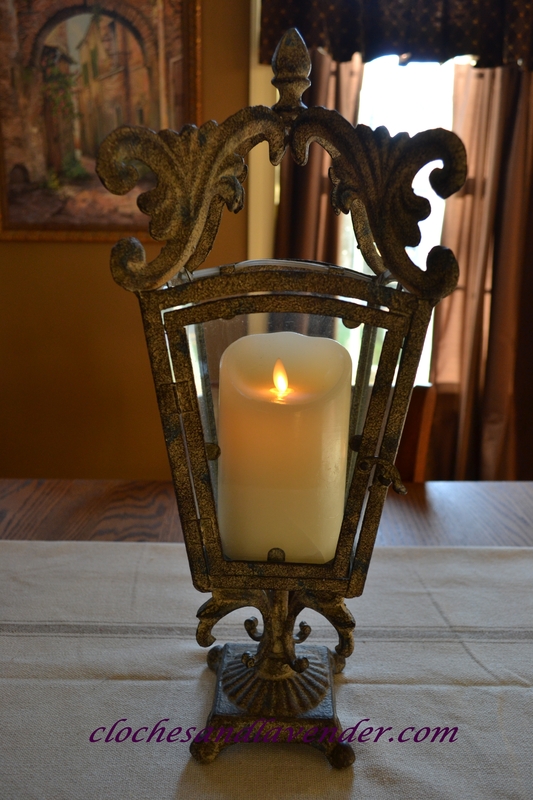 Hi Cindy, your dining table is beautiful and you know I love your lanterns with faux flameless candles. Have them on timers everywhere here and love them. Thanks you so my dear friend, your encouragement always touches me. What pretty touches of fall, Cindy! I love your velvet pumpkins, the colors are perfect. And your lantern and acorns really add to the autumnal feel. The past few days here have felt more like summer, which I love. Cooler weather is on the way though!! Thanks so much my friend. I don’t enjoy when fall weather plays these games. The cool down makes me happy. Everything looks wonderful! You have such a pretty design aesthetic! What a friend, Audrey is to you Cindy! But we knew that already from when you were having your house built. 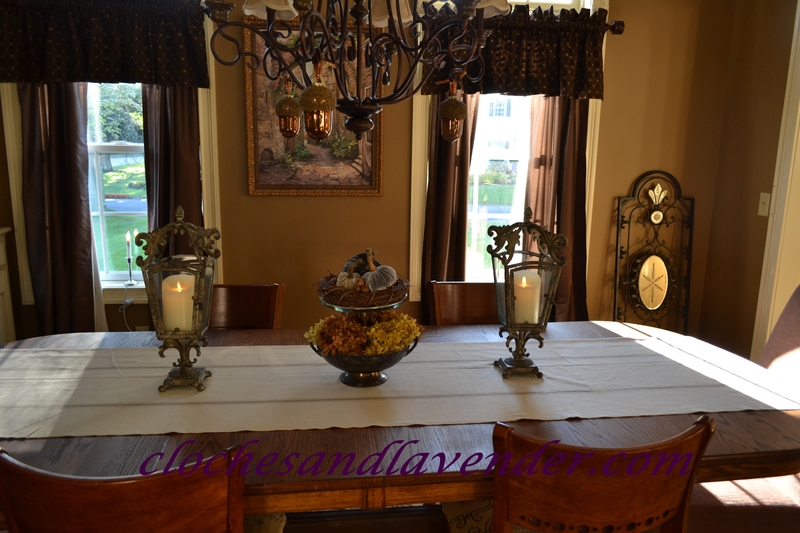 : ) Love your Fall décor in the dining room. That is a gorgeous painting! Just love that lantern; I wouldn’t have thought something with that look came from Pottery Barn, but I wish they’d bring it back. Kathy, when I saw these on their site I knew I had to have them. The baby must be changing every day. 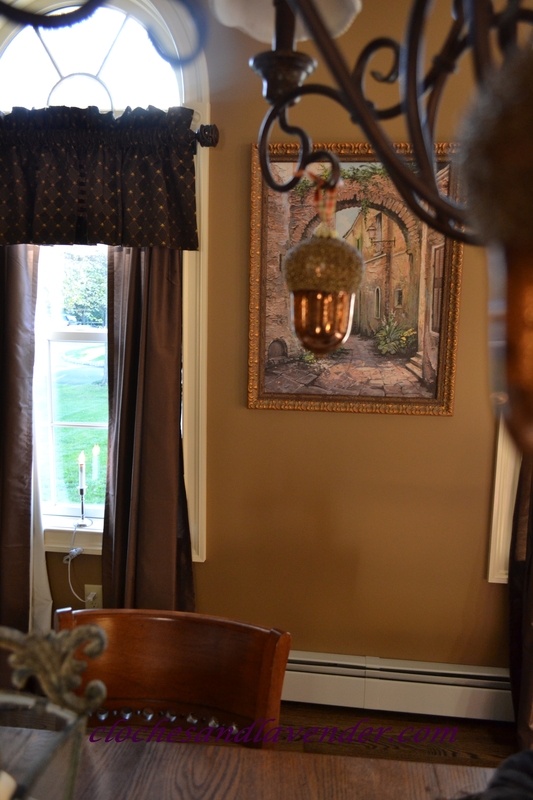 Your dining room looks so pretty decorated for Fall! I really like your centerpiece on the table. I wish I had some of those cute velvet pumpkins. I love those. I like the mix of hydrangeas with the pumpkins and have been noticing that a lot this year. I guess it’s a soft/hard combination which looks so good together. Everything looks pretty and welcoming even without the loud traditional colors of fall. I hope you had a great week and an even better weekend! I like your dining room- the colors are warm and comfortable. The dining table looks wonderful. 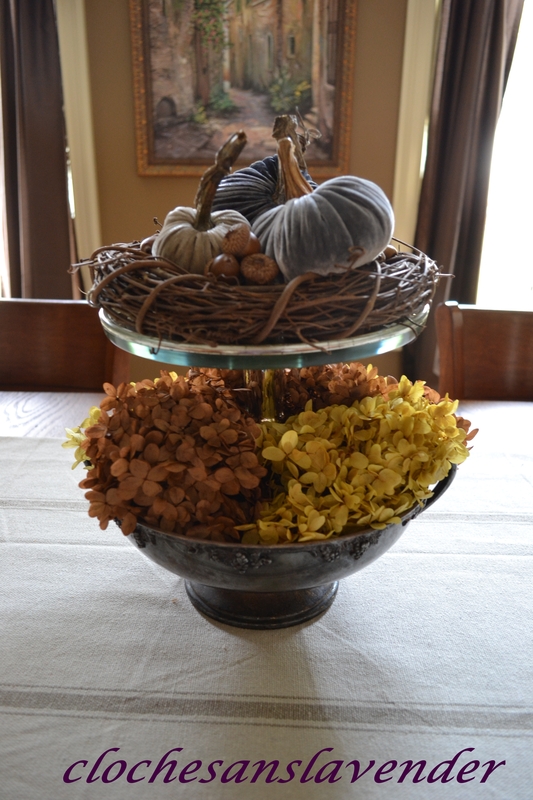 I especially like the dried hydrangeas in the bowl part of the tiered centerpiece. Those lanterns are fabulous- love the aged finish on them! 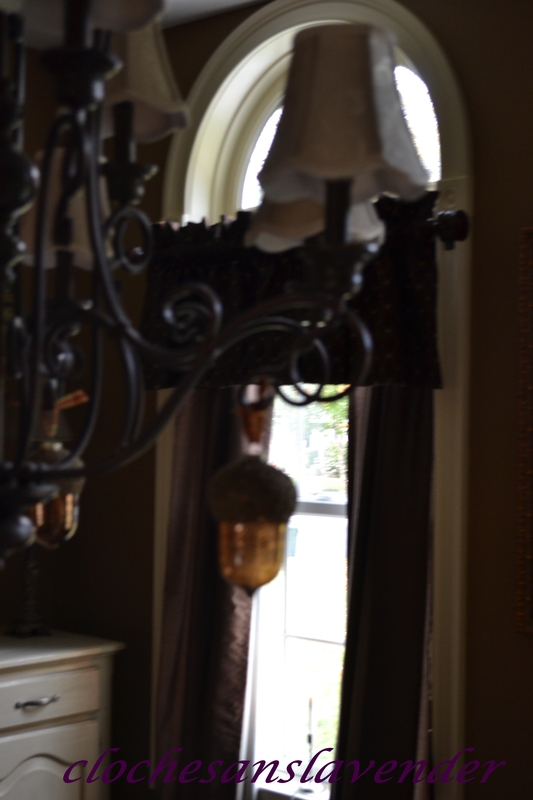 Your dining room looks beautiful!! I wish all your followers could see it in person!! 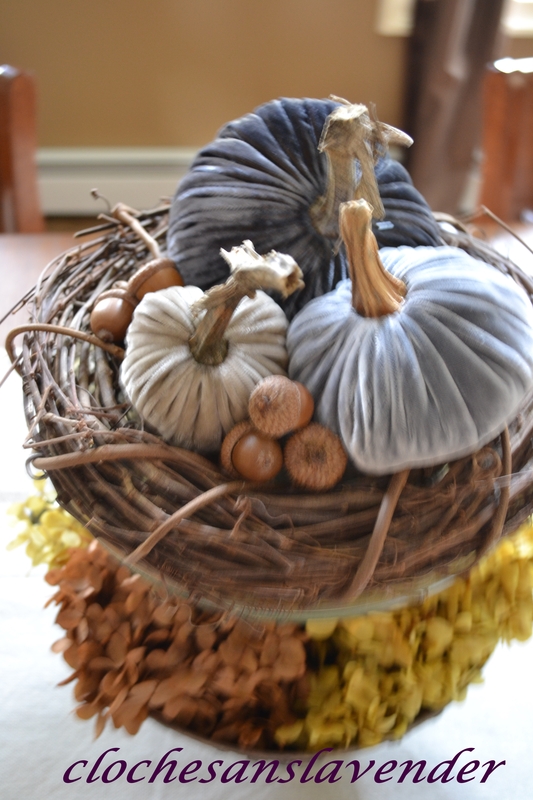 The acorns look great with those velvet pumpkins. I’ll have start earlier collecting them next year….hopefully we can get more green ones. Very pretty, Cindy! Starting to look nice and cozy! Love, love, love your style! 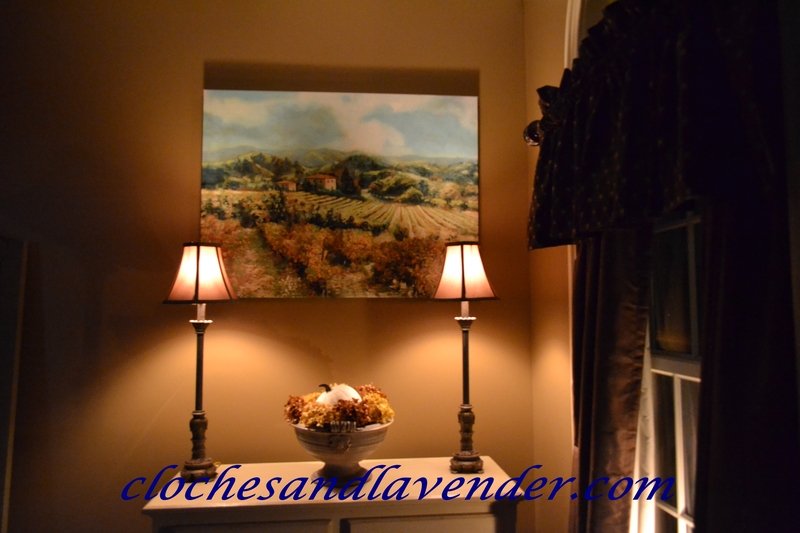 Can’t wait to dig in and see more around Cloches & Lavender (which, btw, is a great blog name)! Thanks JoAnne, it is nice to have you. I hope you follow. I’m following you via email. I love New Orleans. Never been but love the French vibe! Isn’t it funny how something as simple as changing a shade can make a big difference? I love acorns and even brought a few home from New England. I always stick them in the freezer to kill any little critters that might be living inside. lol! I have a mercury glass bowl full of Hydrangea blooms that looks very similar to your silver one. Love the brown acorns! I have one small one like them. Those acorns are simply gorgeous Cindy, and compliment your decor so nicely. I always admire velvet pumpkins, but have yet to score any. I guess I’m waiting for a good sale!